Due to their small size and efficiency, compact heat exchangers are used in many application areas, including HVAC, nuclear power, and electronics. To help increase heat transfer rates and reduce pressure drops in these devices, a large number of studies have been performed, exploring concepts such as incorporating a deforming wall into the design. Using the COMSOL Multiphysics® software, you can evaluate a dynamic wall heat exchanger design. Compared to other heat exchangers, compact heat exchangers have a much larger heat transfer area per volume, usually thanks to dense arrays of plates or tubes. This attribute makes these heat exchangers lighter and more compact than classical heat exchangers. One disadvantage of the smaller heat exchangers is that they have higher pressure drops, which limits the flow rate and thus the amount of heat they can transfer. 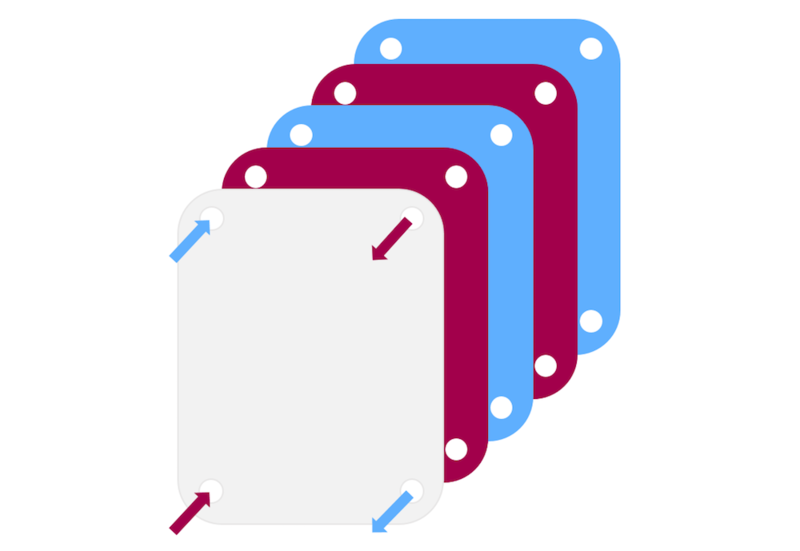 An illustration of a plate-and-frame heat exchanger, a common type of compact heat exchanger. 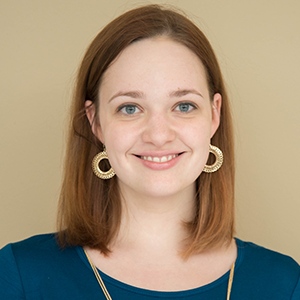 In Reference 1, researchers explored whether they could improve the performance of compact heat exchangers by adding a dynamic wall. When the wall deforms, it generates oscillations that help mix the fluid and lessen the thermal boundary layers. As a result, the heat exchanger is able to transfer more heat. In addition, the oscillations generate a pumping effect similar to that of a peristaltic pump. This makes up for pressure losses, increasing the efficiency of the heat exchanger. We start by modeling a static heat exchanger without a dynamic wall. This way, we can compare the results of both heat exchanger designs. The static heat exchanger geometry consists of an upper wall, bottom wall, and channel. Fluid (water in this case) moves through the channel, steadily increasing in temperature due to a heat flux applied to the bottom wall. At this wall, we set the delivered heat rate to 125 W. Probes at the outlet determine the temperature and mass flow rate of the water when it exits the exchanger. The geometry of a static heat exchanger. Animation showing the deformation of the dynamic wall. For the full details of how to model the dynamic wall heat exchanger, go to the Application Gallery, where you can download the model documentation and MPH-file. 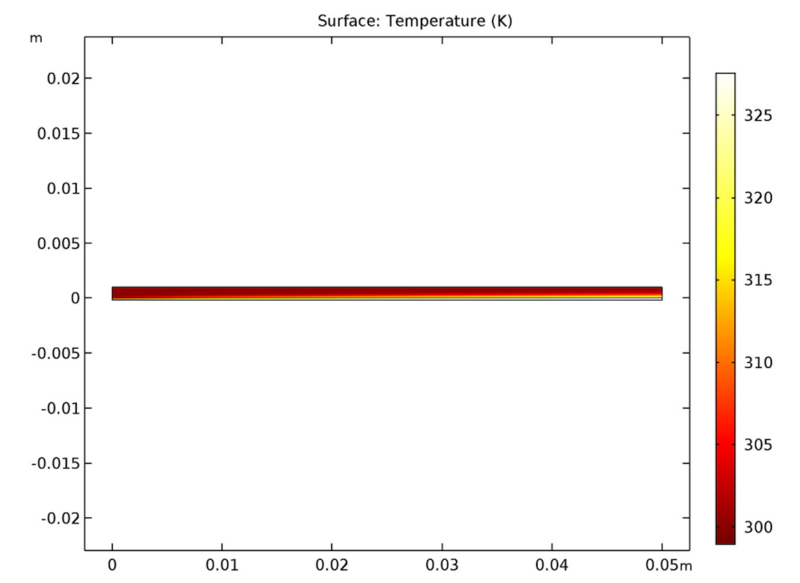 To simulate the heat transfer and oscillation, we couple two built-in features. The first is the Conjugate Heat Transfer multiphysics coupling, which enables us to account for the heat transport between the exchanger and the water. We combine that coupling with the Moving Mesh feature, which simulates the deformation of the wall and channel. Let’s look at the results for the static analysis of the heat exchanger. When the upper wall remains flat, we get a mass flow rate of 5.5 g/s and a heat transfer coefficient of 2900 W/m2. 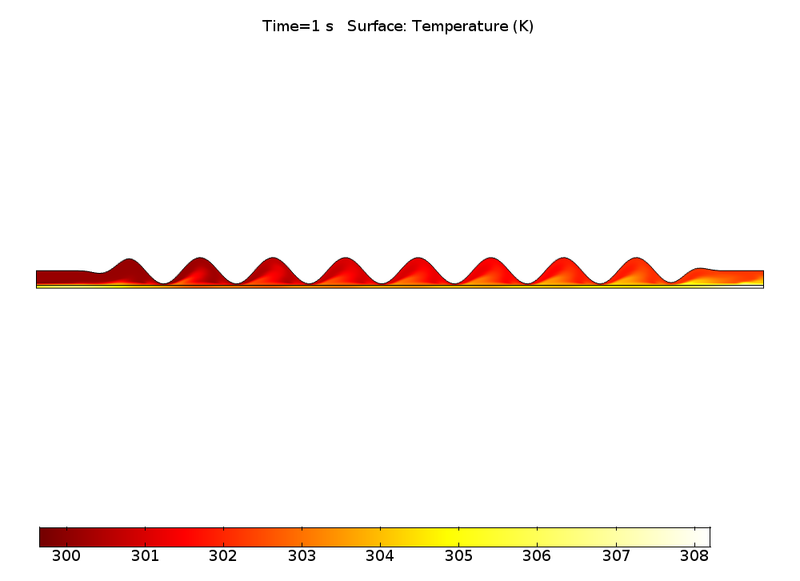 The temperature profile in the channel for the static heat exchanger. 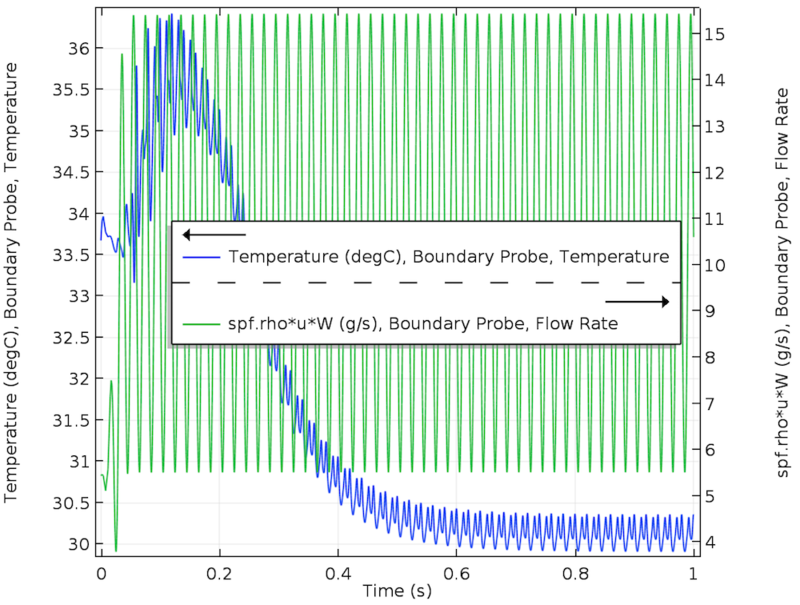 Next, let’s look at the time-dependent analysis for the dynamic wall heat exchanger. The oscillation reaches a pseudoperiodic state after around 0.6 seconds. After it enters this regime, the average mass flow rate is 10.5 g/s, nearly double the rate at static conditions. As expected, the heat transfer coefficient is also higher: about 19,000 W/m2 for an oscillation amplitude of 90%. Left: The variations in temperature and flow rate. Right: The temperature profile in the channel of the dynamic wall heat exchanger. With simulation, it’s possible to analyze and optimize heat exchanger designs for maximum performance and efficiency. P. Kumar, K. Schmidmayer, F. Topin, and M. Miscevic, “Heat transfer enhancement by dynamic corrugated heat exchanger wall: Numerical study,” Journal of Physics: Conference Series, vol. 745, 2016.